Price just reduced for quick spring sale. This ZR1 has many aftermarket cosmetic custom touches. Carbon fiber everywhere you can imagine, front grill, hood grill, all side vents, rear diffuser, rear splash guards and side dam extensions, gear shift cap, door buttons, supercharger cover, fuse box cover, and of course all of the factory carbon fiber. The engine and drive train are 100% unmolested with the exception of the MGW high performance short throw shifter (a must for the ZR1). 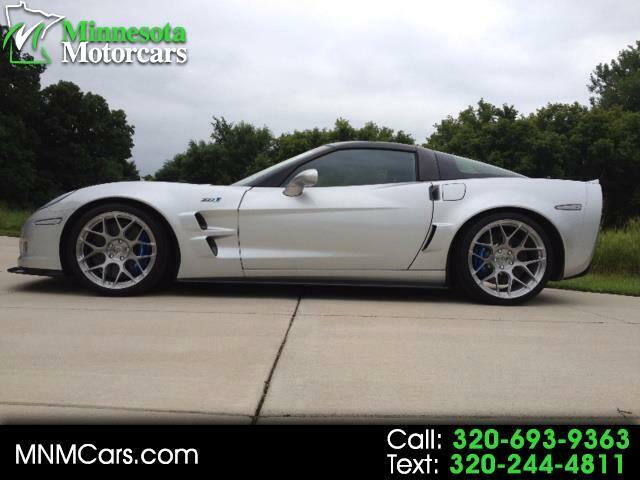 This ZR1 also has magnificent HRE forged alloy P40SC wheels in a light tint coat finish (8K retail). The steering wheel and airbag cover are by Caravaggio, of Toronto Canada, legendary for their skill and craftmanship in creating Corvette and high end Exotic interiors. Way too many extras to list and all of the original pieces included in the sale. Never tracked or abused, just enjoyed. This is a one owner (the dealership owner) car that is perfect in every respect. This ZR1 has many aftermarket cosmetic custom touches. Carbon fiber everywhere you can imagine, front grill, hood grill, all side vents, rear diffuser, rear splash guards and side dam extensions, gear shift cap, door buttons, supercharger cover, fuse box cover, and of course all of the factory carbon fiber. Will sell with the factory OEM chrome speed line wheels, in lieu of the HRES, for 59,995. 1) Innovative Automotive Products quick release front license plate bracket. 2) Carbon fiber dip main front grill just above the factory CF spoiler. 3) 3M clear bra protectant on front end, head lights, and mirrors. 4) Clear reflective side marker lights, both front and rear, with amber LEDs front and red LEDs rear. 5) Carbon fiber dip side gill vents (2 each side). 6) Carbon fiber dip and ZR1 Blue painted supercharger cover. 7) Carbon fiber fuse box cover. 8) Custom painted (ZR1 Blue) fluid cap covers in engine bay. 9) Custom painted (ZR1 Blue) oil dip stick. 10)Custom engine description plaque on fuse box cover. 11)Carbon fiber ZR1 Door Sill Plates both sides. 12)VoZtech radar detector mounting bracket. 13)Valentine One radar detector with laser. 14)Dashtronix Radar Projector. This displays the radar alerts on the OEM heads up display and mutes the display on the detector itself. Nice all the time but particularly at night. 15)Mild to Wild wireless exhaust baffle controller. 16)Skip shift over-ride harness to bypass the factory skip shift function. 17)Auto Armor interior and exterior protection systems were applied at the dealership prior to delivery. 18)Cover Craft ZR1 specific cloth car cover with storage bag. 19)MGW short throw high performance shifter, with sound and heat resistant padding and silicone gasket. 20)Dash Mat dash cover to protect dash when parked outside. 21)Apsis leather steering wheel (pebble and CF pattern leather) with mild D bottom shape. 22)Caravaggio leather airbag cover with white stitching and ZR1 logo. 23)Carbon dip interior trim pieces to replace factory silver painted pieces. Door button bezels, steering wheel spoke covers, shifter knob cap, emergency brake button, front seat mounting bracket covers, and seat recline levers, all to match factory OEM center console CF pattern. 24)Carbon fiber dip exterior main door handles. 25)Aluminum covers for the accelerator, brake, clutch, and dead foot rest. 26)Lloyds logo plush floor mats front and cargo area. 27)Cargo area divider with storage compartments covered in factory carpet. 28)After market iPhone interface for OEM Bose sound system. 29)Black out visor safety label covers. 30)Blockit Drop In Acoustical Sound Deadening System both front and rear. 31)C-Tek Corvette specific battery tender system that plugs into the center console power jack. 32)Carbon fiber dip rear brake vent intakes. 33)Real Carbon Fiber side air dam extensions in front of the rear wheels. 34)Real Carbon Fiber rear mud flap fender extensions to replace OEM plastic pieces. 35)Real Carbon Fiber rear diffuser to replace OEM plastic diffuser. 36)Heavy duty removable corvette jacking pucks. 37)Hydraulic clutch fluid replacement kit. Never tracked or abused, just enjoyed. This is a one owner (the dealership owner) car that is perfect in every respect.